Is Google Breaking Common Rules On URL Referencing? Ok, maybe not as controvertial as recent stories on Google, but does anybody notice that Google does not allow dropping that seemingly useless final slash out of its URLs? 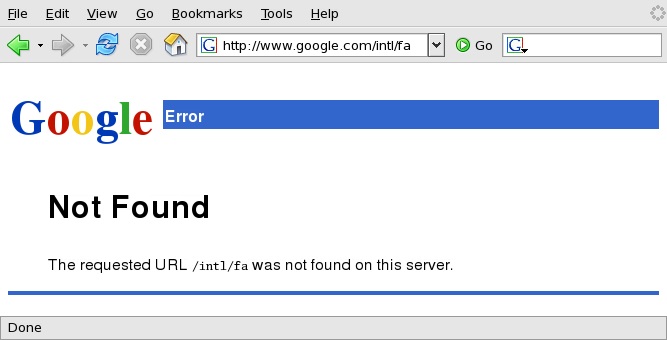 For example http://www.google.com/intl/fa fails miserably (screenshot), while http://www.google.com/intl/fa/ brings up the beautiful logo of the Iranian new year. At least they are not breaking their own rules this time (with, without). Well, sometimes the right thing to do is so obvious, yet you do not figure out when you are deep in there... Anyway, this page is going to see some light, and I'm going to write often and write early! Guess I've written the worst-looking-with-IE valid pice of web page! More to come later, with screenshots of course.